Early this morning…over my first cup of coffee, I posted this. I think this. I live this. I shared this. I didn’t think it was anything out of the ordinary…but now I do. I had a preparation period very first thing, after a long weekend and after walking my Grade threes down to the gymnasium. WHOOT! What a way to begin the week. The work and busyness of marking, planning and hanging up last week’s giants began. I was hard at it, with head down when I looked up at the door. There stood Leah. I met Leah on my birthday, 2015. I had turned 60. My mother was missed. I hadn’t had a chance to speak with my sister. I was, on that day, filled with thoughts of mothering, sistering, womaning and just feeling connected to sister-friends, in general. Meeting Leah, such a spectacular creative, was really important. She was such a gentle and soulful presenter of the process of needle felting, with my students and I listened intently to her engaging presentation because I know, for fact, that I want to try this. Once we had even a few moments to chat, I learned that one of her favourite places to visit and to collect supplies is north on the highway to Carstair’s Custom Woolen Mills. I had the shear joy of sharing with her that much of the equipment in the mill was equipment that my grandfather, John Moors, used and maintained over his career in Magrath, Alberta. 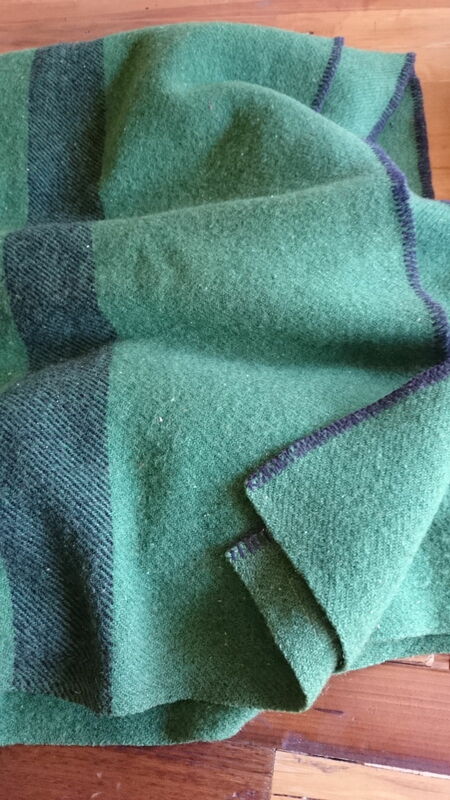 As an aside, I told her that I’ve been on the look out for almost twenty years for a blanket from that mill. Once, a dear friend, living in Grand Prairie at the time, gave a special gift to me and that was the corner of her wool blanket. 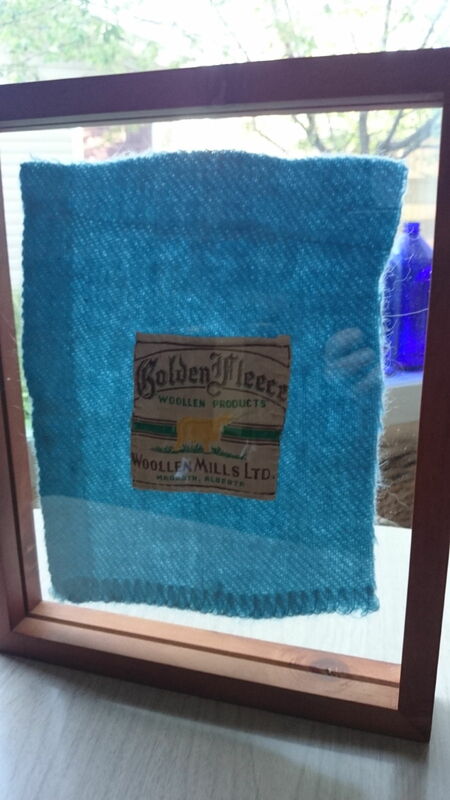 She realized that it was from the Magrath mill…but I guess, was unwilling to part with the cozy blanket and wrapped up the label in a Christmas card just for me. Now…don’t get me wrong…I DO appreciate that gesture, but as I explained to Leah…I would dearly treasure a Golden Fleece wool blanket. She said, “Kath…leave that with me…I’ll keep my eye out for one.” I took pause, thinking to myself, “Hmmm…this lady doesn’t know how hard I’ve looked. I don’t think she’ll ever have any luck.” But…as we do, we believe in the kind gestures of others and Leah DID seem sincere. I looked into the bag…and this treasure…this object of my dearest affection, was there. 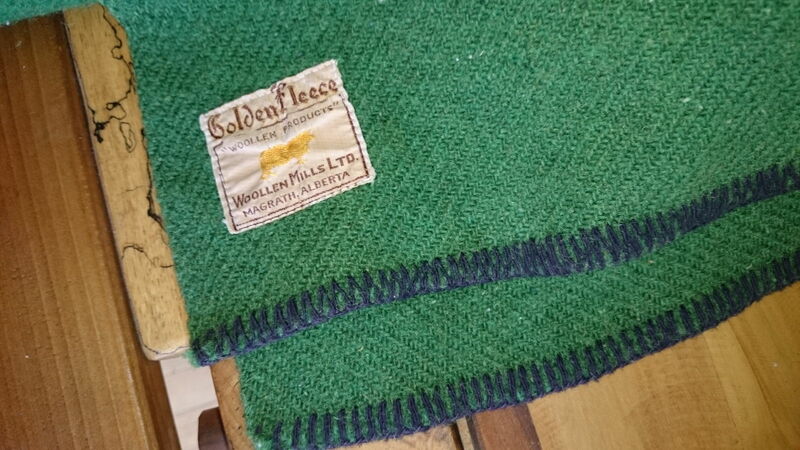 I saw a green wool blanket…the most beautiful colour with its Golden Fleece, Magrath, Alberta label. I pulled myself into the embrace of this beautiful woman and fell to tears. 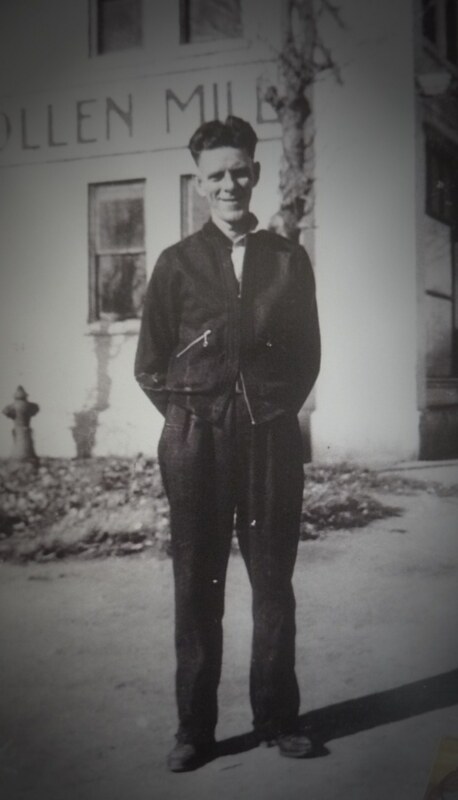 Unbelieving…filled with joy…remembering my grandfather, amazing John Moors. I knew that, for fact, my grandfather had remembered me. Our ancestors and their love is unstoppable and endless. It is important to keep eyes wide. We chatted for a while. I remembered the smell of the mill. Leah said that she knew that moist wool smell from Carstairs. Wool connected us. She just kept nodding. The paraphrased story from Leah…”The night before your classes to be taught on May 8, I was cutting up my woolen blankets in preparation. These would be used for the students’ needle felting. 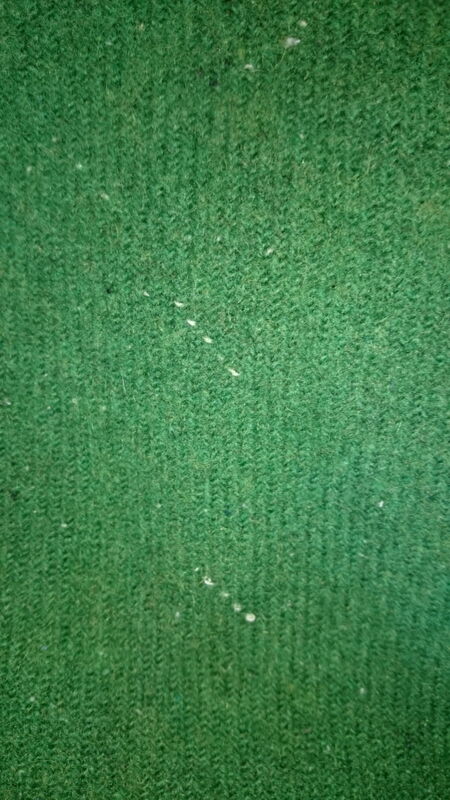 I came up to this blanket (having not met you) and decided that it was just a beautiful woolen blanket. 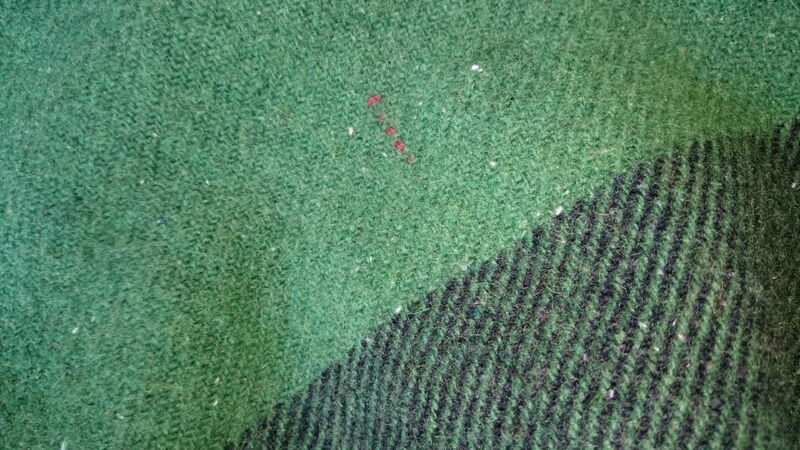 It even has a tiny piece of red wool woven into it. I asked my son if he might like a nice blanket for his car and he accepted. And then I met you. Without hesitation and regardless of missing a prep, and focus time in Math and Language Arts, I said…YES! I met Leah who loves wool…almost as much as I do. And….the rest is magic. And the rest…is history. 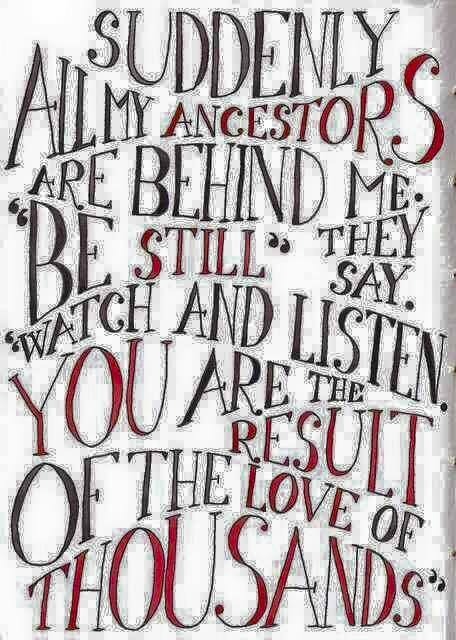 Thank you, Leah, for being a channel of ancestral love. Thank you for the red thread and for the woolen blanket. It will be wrapped around me on my red sofa tonight. I have found a tremendous friend in you. Leah Donald…contact her via ArtFelt Studio. Book now, teacher friends, for next year!